Handwriting problems can occur among those with both good and bad coordination, those who can draw well and those who can’t, those who have missed out on systematic handwriting instruction and those who have had too much of it. Dysgraphia (handwriting problems) can occur for a variety of reasons. The lack of one single cause of these problems can be confusing to educators wishing to offer help. Only in a minority of cases can handwriting problems be corrected by handwriting instruction; and in some cases, handwriting instruction can make the problem worse rather than better. The Davis approach to dysgraphia correction evaluates at least seven reasons why dysgraphia can occur in an individual before embarking on an appropriate course of action. In many cases, the cause can be addressed effectively through application of Davis techniques. 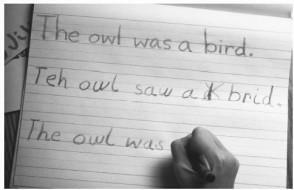 Children whose writing is not progressing at school can be helped by the Davis methods, as can adults who rely on handwriting for their work. This will not provide a formal diagnosis, because it is entirely based on self-reported symptoms, but it will help you understand whether your difficulties fit the pattern of dyslexia. The difficulties you list – problems with reading, writing, and spelling – certainly are consistent with dyslexia. The Davis program can help adults of any age. You can use this web site to find a Davis provider near you and arrange for an initial appointment to discuss your difficulties and learn more about what benefits you could gain from completing a Davis program. My 13yr olds primary dyslexia problem is spelling as he seems to have very limited visual memory for letter sequences (though a gifted child with exceptional abilities to sequence other things like Lego robot parts). Do you have s program for someone like him? And we don’t live near a facilitator but could come to the Bay Area for a week if that could be appropriate for instruction. Tina, it is best to consult with a Davis provider directly to determine what services could be offered to your son. Please use this site to find a provider you can contact by phone or email. The Davis program would definitely help with visual memory for letter sequences, but it is something that takes practice and a commitment to follow through with Davis exercises and tools. For a 13 year old child, level of motivation is very important – your son needs to want the help that a facilitator can offer. I have a 15 and a half year old son and his father is dyslexic would my son have inherited that too because he seems to be having problems with his learning especially with retaining information and reading? Dyslexia does tend to run in families, so yes, it is very possible that your son inheritated his learning traits from his father. I have an 8 yr old son who is hyperactive and has problems in reading and he sometimes have difficulty in spelling, he does well in mathematics. I am in Botswana and i am unable to locate any nearby Davis provider. Is it possible that he might be having dyslexia? Yes, if he is having problems with reading then he is very likely dyslexic. 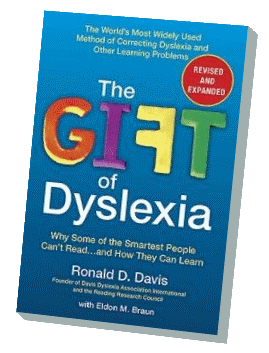 You may be able to work successfully on your own with him, following the methods described in the book, The Gift of Dyslexia. I have a 2nd grade niece who was recently assessed within her school and the findings suggest she may be dysgraphic. The results suggest she is not dyslexic. Some of her issues seems consistent with dysgraphia but no one within her school system seems to know enough to be definitive with a diagnosis. She lived in Bethesda, Maryland. I am searching for a qualified professional in her area to do a full assessment and potentially offer some recommendations for treatment/management? Any suggestions would be appreciated. Thank you! So if you are interested in a Davis program, then the first step would be to contact a Davis facilitator. Please keep in mind that Davis facilitators cannot provide a formal diagnosis. A Davis assessment is specifically designed to screen for the Davis program.